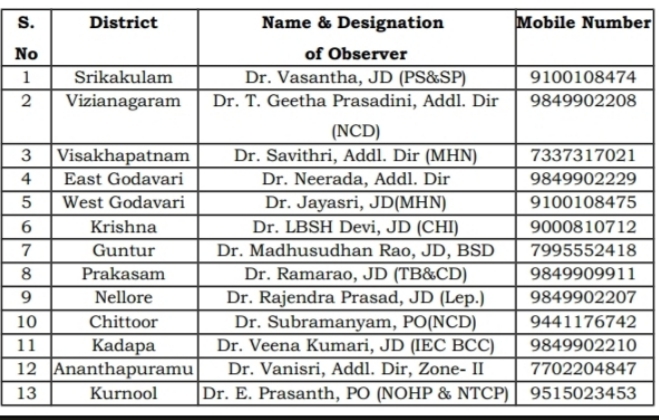 The National Deworming Day programme is being implemented in 13districts of Andhra Pradesh state under RBSK and the following NodalOfficers O/o CH&FW, AP are deputed for monitoring, identification andbridge the gaps for effective implementation of National De-worming Day(first round) on 07th & 08th February 2019. Coordinate with DMHO, DEO and PD ICDS for proper launch and conduct of the National De-worming Day program in the District. To see whether all Anganwadi centres, Govt. schools and Govt. Jr. Colleges are covered and supplied with medicines and IEC material. 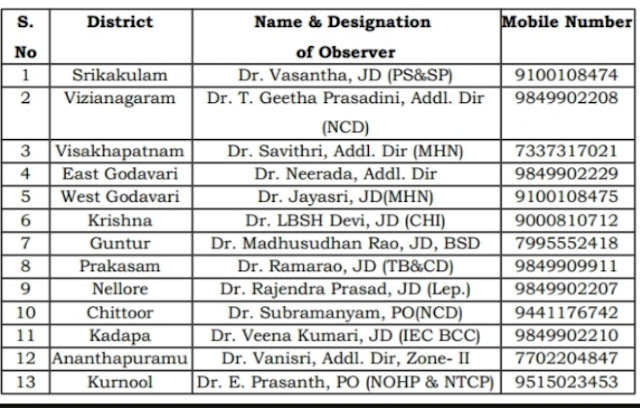 Intensive monitoring in the focus area schools i.e. KGBV/Ashram schools /Residence schools etc. ddress any Mild Adverse Event / Severe Adverse Event and respond immediately as per protocols and handle them carefully. All the monitoring officers shall have to ensure successful conduct ofNational De-worming program as per Guidelines / Check list enclosed. The District Medical & Health Officer are requested to makearrangements for accommodation, mobility to the Monitoring Officers andbook the expenditure under supportive supervision of NHM activities andmeet the expenditure from the funds available under District Health Society.